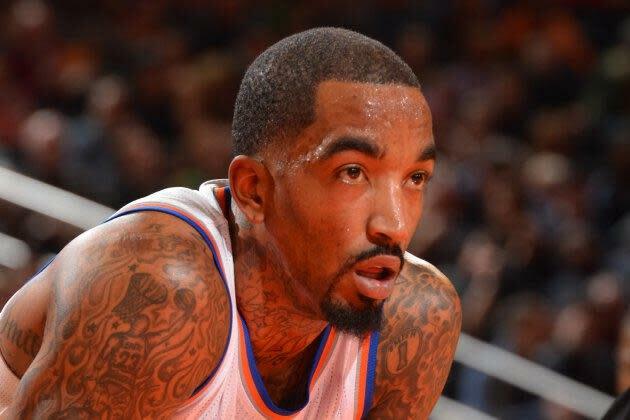 New York Knicks shooter J.R. Smith has a deserved reputation for doing things his own way, but few of us were prepared for his actions on Sunday against the Dallas Mavericks. In the second quarter, Smith untied the shoe of Shawn Marion during a free throw, ensuring that the veteran forward would have to play an entire possession in danger. It was a resourceful, yet eminently goofy move by J.R.
On Tuesday night, Smith attempted the trick again, although it seems like opponents are now aware of his methods. In the first quarter of the Knicks' home game against the Detroit Pistons, Smith reached down to grab at the laces of big man Greg Monroe during a free throw by Josh Smith. However, Monroe avoided Smith's grasp, lifting his foot so that it could not be snatched at. It appears as though Smith might have to wait a while to try this move again, because at least one opponent is aware of it. On top of all that, Smith has received some trouble following Sunday's untying. As reported on Twitter by Neil Best of Newsday, Knicks head coach Mike Woodson has said that he will speak to his player about his actions. It also looks like the NBA has taken note — according to reports from both Marc Berman of the New York Post and Steve Popper of The Bergen Record (via The Point Forward), Smith was warned (without fine or suspension) not to do anything of the sort again. It remains to be seen if Tuesday's attempt will compel further action from the league, but we should appreciate the fact that Smith is committed to doing whatever it takes to win. Even if brings him a fine, he'll untie as many shoes as required. What a hero.